Hello and welcome to Cyborphic’s Blog! This blog, created after the Talos II: The Science Fiction Theatre Festival of London and before our first workshop series on the genre, will become a place to record and comment on the process of creating, researching, workshopping, watching and, more broadly, experiencing science fiction theatre. More than that, in light of the coming workshop on lost Greek tragedies, organised by our associate director, Andriana Domouzi, the blog will also explore our other passion: Greek theatre. By this, I should specify, I’m referring to three key categories: the classical Ancient Greek plays, the contemporary Greek theatre (an almost entirely overlooked theatre culture outside Greece) and, perhaps the most thrilling of all, the Fragmentary (a.k.a. Lost) Plays of Ancient Greece*. It’s all about that thin line between Greek theatre and geek theatre. My primarily interest in the genre is as a writer first, then as a scholar. While studying for an MA in Playwriting (2010-2011) I experimented with futuristic, dystopian & Lovecraftian plays and for my PhD in Creative Writing, I explored the genre via utopian/dystopian theory while further experimenting with the form and the many sub-genres. Stage the Future (26-27 April 2014) was the first conference on science fiction theatre, an interdisciplinary two-day conference that welcomed scholars and theatremakers. This was originally hosted by Royal Holloway, University of London, and the following year’s it took place in Phoenix, Arizona, where it was hosted by Arizona State University. If interested in reading about the 1st and 2nd Stage the Future conferences, conference reports can be found here and here. In terms of original academic research on science fiction theatre, I gave the paper “First as tragedy then as Sci-Fi: Sci-Fi Drama as a Return to Theatre’s Roots” in which (in a pre-Cyborphic manner) I drew parallels between sci-fi theatre and Greek tragedy. I also co-wrote (with Susan Gray) an article on the genre’s background, present and potential future, titled “Past and Future of Science Fiction Theatre”, published in the journal Foundation: The International Review of Science Fiction. More publications are forthcoming. Furthermore I have frequently attempted to introduce sci-fi theatre to university students. At Birkbeck, I had the opportunity to add The Nether by Jennifer Haley to the syllabus of Reading 21st Century Fictions while teaching there. It was enjoyable, and the students were curious and intrigued, but while it’s an amazing play, I wouldn’t recommend it as the introduction to the genre – many students find it shocking. But it’s certainly one of the most powerful contemporary examples. At the University of Leeds earlier this year, I delivered what, as far as I’m aware, was the first practical and interdisciplinary workshop on the genre (combining theory, writing and performing.) It was a three-hour session that introduced the basics (definitions, history, challenges, successful productions) and instructed the students to revisit familiar texts with the aim to adapt them into new sci-fi texts. I won’t say more now, as the workshop I will lead today will be an updated version of that. What was particularly rewarding was the excitement of the students – most of them had never heard the term before – who felt they were introduced to an entirely new universe where a different kind of theatre was possible. A theatre festival dedicated to sci-fi theatre had been a dream for a while, and the conference – which contained performances in addition to academic papers – was a first step towards that dream. What was most beautiful about Talos was the dedication and enthusiasm of everyone involved. During both our submission windows (for Talos I & II) we received more than 300 scripts from all over the world. But most importantly perhaps, what really mattered in the end were the friendships that developed. Many artists who were involved in the first festival were also keen to participate in the second, which brings me to the final kind of “engagement” with the genre, one that is very central to the positive cultural & social impact of both theatre and science fiction. Following the creation of GAMMA – a social network for UK-based Greek artists – a few years ago, I’ve been for a while planning a similar community for theatremakers who wish to create more science fiction theatre. 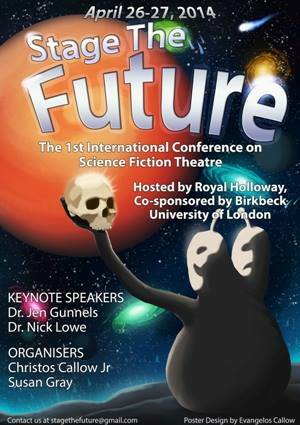 Since the first such networking event was announced, it very quickly sold out, so here’s hoping this will be the start of a new chapter in the history of sci-fi theatre in the UK, a community of likeminded people who also believe that the theatre of the future is, necessarily, about the future. The 1st workshop series of the Science Fiction Theatre Research Lab start today, 21 May 2018, while the first meeting of the Sci-Fi Theatre Network is on the 25th of May. Will be back to discuss the outcome of these projects. In the meantime, keep calm and stage the future.